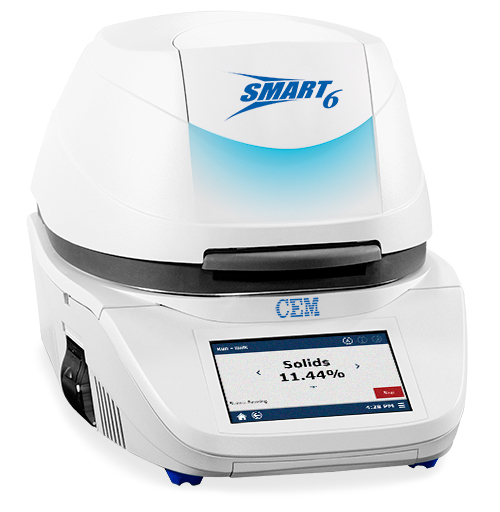 (Matthews, North Carolina) September 15, 2015 – CEM Corporation, a leading supplier of process control solutions, is pleased to introduce the all new SMART 6™ Moisture/Solids Analyzer. The SMART 6 features two major innovations compared to CEM’s previous SMART 5 system: the ability to accurately analyze both wet and dry samples and a significant reduction in sample drying times. These benefits are possible through the development of iPower® technology, which features a patented multi-frequency energy source for sample drying. As added benefits, the SMART 6 features a state of the art touchscreen software package with complete statistical analysis and optional IP65 compatibility. The revolutionary iPower technology employs lower frequency energy to quickly remove free moisture and penetrate the sample for fast and efficient heating, while higher frequency energy helps create a uniform heating environment to fully remove bound moisture or non-polar solvents. As a result, iPower creates an analysis with unparalleled speed and precision. One Touch Methods™ further simplify the user experience by offering a library of optimized CEM methods along with breakthrough new iDri™ technology. iDri is an advanced analysis that can further reduce test times with results in as few as 60 seconds, less than half of the previously possible test times using other direct analysis technologies. CEM Corporation, a private company based in Matthews, North Carolina, is a leading provider of scientific solutions for critical laboratory applications. The Company has subsidiaries in the United Kingdom, Germany, Italy, France, and Japan, and a global network of distributors. CEM designs and manufactures systems for life sciences, analytical laboratories and processing plants worldwide. The Company’s products are used in many industries including pharmaceutical, biotech, chemical and food processing, as well as academic research.